Working within constraints is paramount to designers especially to tackle large, systemic problems. As part of SVA Products of Design’s partnership with Veterans Affairs (and held through the Design Research and Integration class taught by IDEO’s Lawrence Abrahamson), designers Smruti Adya, Bernice Wong, Lassor Feasley, Juho Lee, Christopher Rand, and Kuan Xu designed a number of solutions to improve women veterans’ experience in three different areas specific to visiting the VA Hospital: transportation to the hospital, wayfinding once in the building, and pre-appointment communications. (VHA) services—VHA doctors and staff, as well as other professionals who provide services to veterans. Bringing together what they heard from the interviews, the team was able to map the journey of a woman veteran as she navigates the various touch points of obtaining and attending appointments at the hospital. They decided to design for the three areas which they felt were key pain points described by interviewees across the board. The team felt strongly about this insight however, upon deeper investigation, they realized that it was beyond a condition of the in-hospital environment. “If we can’t make systemic changes to male veteran attitudes, we want to guide women veterans to safe spaces inside the hospital, as quickly as possible,” said designer Chris Rand. The team developed a subtle solution of strategically placed ‘breadcrumbs’ that would lead to the 9th floor women’s clinic and targeted the question; how might we help clients navigate to multiple locations within a busy hospital without adding visual clutter and with minimal cost? While marking this route, the team wanted to remain unobtrusive to the greater hospital landscape. They did this by making use of colors and symbols without the visual clutter of traditional signage. The team made use of strategic areas such as hallway corners and door handles, which are often left unused. “We wanted to do as much as we could, while adding as little as possible,” said designer Kuan Xu. The final design included a series of acrylic corner guards and door knob hangers, easily installed, adjusted, and moved. Another critical realization for the team was that the patient journey starts at home, once the woman veteran receives her appointment confirmation and details in the mail. As such, the team also redesigned the brochure that comes with her appointment package, to both introduce the symbology of the breadcrumbs and extend the personal, comfortable environment of the women’s clinic to the home. The team found that women veterans face challenges traveling to the hospital for several reasons– most commonly, they need to make numerous arrangements including taking time off work, scheduling childcare, juggling school demands, and more. “Women veterans always put their family first,” said one VHA administrator, “they prioritize their children or grandchildren over their doctor’s appointment.” The team also learned that many women veterans experience difficulties with mobility or mental health as resulting from their time in service. Determined to seek out an alternative, they reached out to representatives from the four ride share companies with a presence in New York: Uber, Lyft, Juno, and Via. They designed branded interfaces to propose different, viable methods by which the organization could support veterans. 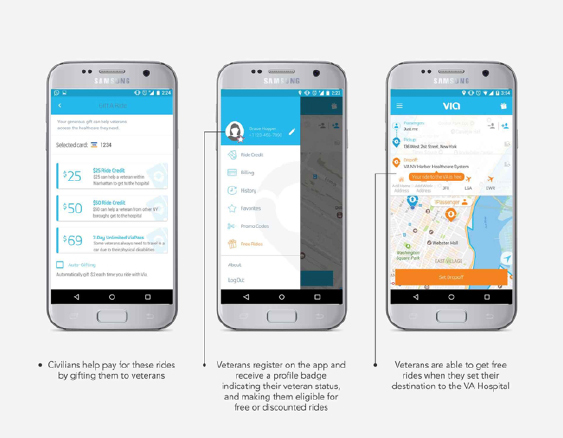 The first option was a feature on veterans’ apps in which they could access discounted rides originating from and arriving at the VA hospital. The team imagined that the company would absorb this cost, contingent upon on the number of veterans making use of the feature. 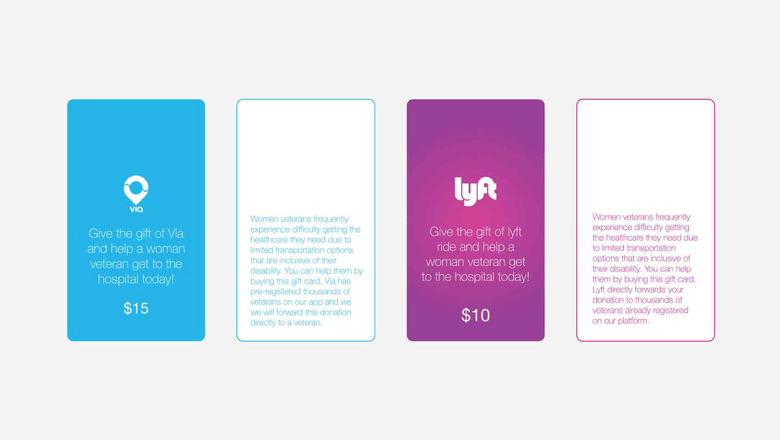 The second, more sustainable alternative, was a feature that gave civilians the option of gifting rides to veterans, being prompted to donate a few dollars at the end of their own trips. The third proposal was to provide civilians the ability to purchase gift cards in public spaces such as coffee shops, which would then be sent to the VA hospital and given to veterans when making an appointment. The team is currently in communications with representatives from the ride share organizations, in hopes of taking the first option forward. Lastly, the team looked to opportunities where they could humanize the language of pre-appointment communications with women veterans. Given the complex and highly regulated environment of the veteran health care system, much of the print information available to patients was impersonal and difficult to parse. As such, the team hoped to re-evaluate these touch points, including the appointment reminder letters and the doctor profiles section of the VHA website, seeking opportunities to integrate more precise and comprehensible language. They began by researching existing examples of methods used by private clinics to correspond with their patients. Over and over again in their interviews, the team had heard great stories about a specific doctor or staff member that turned a regular hospital experience into a something memorable. However, they came to a breakthrough moment after speaking to a woman veteran with several positive experiences at the VHA. She said, “I don’t really care if you have a professional profile for every one of these doctors. I just want some stories about who these people are! ...We need to inspire some confidence. There are great practitioners here.” From this, the team realized that they needed to emphasize the strengths and stories of the VHA’s dedicated doctors, administrators, and staff. The team was able to create several prototypes, illustrating the direction towards which the VHA could improve their methods of communication with patients. Despite an abundance of pre-appointment interactions the VHA had with patients; a reminder letter, an email, and a reminder phone call, as well as other online resources, there were few resources for patients to learn about their providers prior to an appointment. Even in situations where patients were able to learn more about their providers, the team heard that patients were often disappointed by the resources available to them. It was important to the team that their final designs be implementable at little disruption and cost to the VHA. For this reason, the team integrated patient and physician stories into pre-appointment correspondences that were already being sent to women veterans.